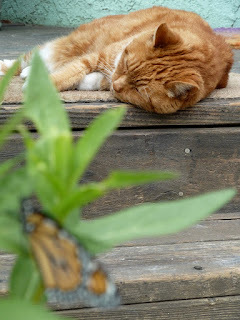 Archie's Garden: Alligators and Keeled-Over Cats! Keep an eye out for more posts soon, including photos of our milkweed sprouting project. Milkweed grows slowly; it's not easy keeping up with the never-ending demands of hungry monarch caterpillars without dropping lots of money at the nursery. In an upcoming post we'll show you how we're trying to solve that problem; in the meantime, give our Facebook page a "Like" if you want to receive the latest updates in your News Feed.